Many thrillers are focused on the future: something terrible is about to happen; someone has to stop it. The clock is ticking, and the fuse is growing shorter, minute by minute. Then there are stories that are focused on something terrible that happened in the past, an event that left the potential for violence hidden below the surface like a land mine. You know it’s there, somewhere, and every step you take could trigger the detonator and set it off. That’s the animating tension in the first adult novel by Agnete Friis, who previously co-authored the Nina Borg series with Lene Kaaberbøl. Ella Nygaard is an unlikely heroine. She’s wary and cynical about the social system that provides her a place to live and counseling for her debilitating anxiety attacks, but strips her of her dignity and threatens, always, to take the one thing from her that matters: her son, Alex. She knows Denmark’s social system all too well, having been a ward of the state since she was seven years old. That was the year her father murdered her mother somewhere in the dunes on the wild north coast of Jutland. She was never able to reconstruct what happened, not in the days following the murder when police tried to coax an eyewitness account from a traumatized child, not now–but she feels it in her body, tension and tingling in her fingers, followed by a full-blown storm that knocks her off her feet. After one of those attacks, she is hospitalized and learns, on her release, that her son has been placed with foster parents in the countryside. She coaxes a neighbor to drive her to their farm, and then to help her and her son escape north, to the neglected seaside house her paternal grandmother has left her. It’s her only refuge, but it’s also the place where the knowledge of what happened when her father killed her mother lies buried. We approach that moment from two directions: from flashback chapters about her father’s affair with a bewitching woman, and about her mother, who left a millennial religious sect to marry for love but can’t escape the deeply embedded belief that she is damned. In the present, Ella has met a childhood friend and acquired a strange acquaintance – an eccentric woman artist who is losing her home and moves in with Ella and her son, a temporary visitor who can’t be dislodged. The three of them create a strange sort of family haunted by a sense that something is deeply wrong. Friis has stretched her neck out with a prickly protagonist who has resigned herself to life on welfare, always struggling to get by without money, often focused on getting a packet of smokes or a bottle of vodka. She loves her son fiercely, but does things that puts their future at risk–and puts her one step closer to triggering that buried memory. Though veteran mystery readers may not be entirely surprised by the denouement of this complex and multi-layered mystery, they may well be caught off guard by a character who stubbornly does everything she can to be unlovable, yet somehow becomes an enormously sympathetic guide to the experience of lives lived on the fringes of society. Well, this is embarrassing. I’ve really let things go around here. You’d think I turned into a hermit. Well, in keeping with that notion, here’s my review of Danish author Thomas Rydahl’s first novel, reposted from Reviewing the Evidence. by Thomas Rydahl and KE Semmel, trans. Readers of Scandinavian crime fiction, skimming through recent translations, may be thinking it’s nothing but clones of Mankell and Läckberg, a too-familiar choice between gritty social problem procedurals or convoluted crimes committed on scenic islands – yawn. Thomas Rydahl has written something different. First, there’s no snow. THE HERMIT is set on one of the lesser-visited of the Canary Islands. That’s not entirely original; Mari Jungstedt has set a new series there, too, among the large Swedish expatriate community. But Rydahl’s protagonist is not your typical detective. Erhard Jorgenson lives in a shack with two goats for company, drives a rattletrap cab, and lives on next to nothing. He’s no longer connected to his native Denmark, where he left behind an estranged family and one of his fingers. (How exactly he lost that finger is a tease from the opening pages – but not particularly relevant to the plot, like so very much in this book.) There are police, but they are not dogged investigators so much as public servants sensitively tuned to the need for tourism and quickly-closed cases. And there isn’t any CSI wizardry. Not only does our hero lack access to forensic labs, he doesn’t know how to use a cell phone or a computer. He has left the world behind, apart from picking up fares when he feels like it, tuning pianos occasionally, and drinking with a happy-go-lucky couple. Three things go wrong early on. First, Erhard comes on a fatal car accident where a pack of wild dogs is making a meal of the dead driver. Then a car is found on a beach, which has in it the body of an abandoned infant in a cardboard box, nestled in torn-up Danish newspapers. Finally, Erhard loses his drinking pals when the man disappears and the woman lapses into a coma after a savage beating. Erhard’s response to these events is as peculiar as he is. He takes a finger from the man killed in the accident to replace his missing one. He thinks the police are covering something up about the dead infant, so he kidnaps the prostitute who is their prime suspect and holds her in chains to compel her to tell him the truth. And when he realizes his friend is gone and his wife is unconscious . . . well, explaining how he handles that conundrum would be a spoiler. Suffice it to say, this is an unusual book with an eccentric hero who wants very badly to know how that child ended up abandoned and, through a combination of persistence and intelligence, manages to untangle a complicated story. This novel suffers from the acute global shortage of red pencils in the publishing world. Hundreds of pages relate Erhard’s shambolic daily life in detail, and the dialogue would be less exasperating to read if it were in quotation marks instead of being signaled with a literary dash, Cormac McCarthy-style. That said, readers who stick with it are likely to find themselves caught up in Erhard’s offbeat world view and in his quest to discover how that car and its tragic cargo ended up on a remote beach. S.E. 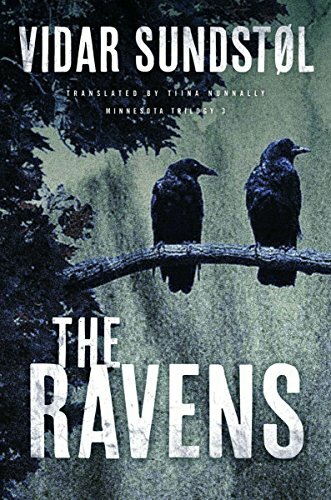 Semmel’s translation of the first debut novel to win Scandinavia’s top award for crime fiction is excellent. Whether its enormous popularity in Denmark will travel is yet to be seen, but it certainly adds something new to the Nordic noir palette and is, in its weird way, compelling. I got to know Dorte through her blog many years ago, first as a reviewer and then as an author. I only recently discovered that she not only writes cozy mysteries, she also writes the harder-edged ones that are my personal preference. 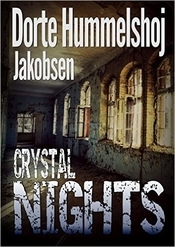 So I was both happy and a little nervous when she offered me a review copy of Crystal Nights, a psychological suspense novel crossed with a police procedural set in rural Denmark. I needn’t have worried. I enjoyed reading it very much (and very quickly) and am only embarrassed that it has taken me many weeks to write a review. The book opens with a passage from a familiar Hans Christen Andersen story, The Snow Queen, recounting the ending in which slivers of a broken mirror fly around the world and enter peoples’ eyes and hearts, spreading evil everywhere. I always found Andersen’s stories extremely creepy when I was a child, so I braced myself. The next section, set in 1938, is a brief but gripping account of a Jewish woman packing up a few belongings and living in hiding in 1938 with her husband and small children, learning about krystallnacht and wondering what people are capable of. The last we see of them is traveling to what should be a safer place, but isn’t, with her little boy desperately ill and her husband too paranoid to seek help. Dorte’s translation of her Danish work (which won an award in Denmark) is very well done. I only once or twice noted a word choice that seemed a trifle awkward. She has a nice way with description – for example, “her busy fingers picked at the knitted cardigan like nimble mice gathering material for their nests.” I am a lazy reader, so the section that took us back to 1963 confused me for a while, but I was eager to find out what the link was between the opening pages and the small Danish community where an adventurous boy disappears. Altogether, it’s an enjoyable story with a slightly Gothic psychological twistiness to it. The book is set in a region of Denmark that the author knows well. She has created a photo companion for the book to supply local color and background.